No matter the time of the year, honoring a veteran is an age-old tradition. So, why not make sure that these veterans know how special they are? Here are some great ideas to make any veteran know just how grateful you are for their service. 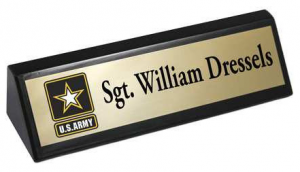 While it may seem a little thing, designing a custom plaque for a well-deserving veteran will help them understand what their service meant to you. 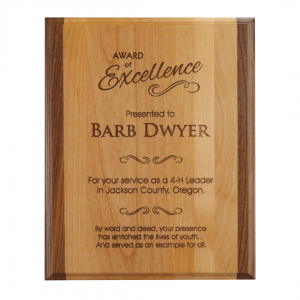 From choosing the best wood and finish to creating all the little details on the engraved plate, these awards are one of a kind. Add names, titles, designations and choose an image or graphic to go with the text. Remember that these award plaques are meant to be just as unique as each veteran is. 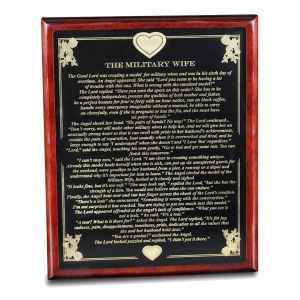 From an “Award of Excellence” to a commemorative message, these plaques will make any veteran appreciate your time. But, no matter what you decide on for the text for these unique custom plaques, remember that your veteran deserves something that will fit their personality and service. Each solid wood desk wedge comes with an attached metal name plate, which is personalized with up to two lines of text and a logo or graphic. So, add the military branch logo or something that symbolizes the veteran’s service. From a ship to a boot and sword, make sure to customize these decorative name plates to fit each veteran for which you are shopping. And, no matter which material you choose for the desk wedge, it is sure to please your recipient. From a dark walnut to glossy black, these name plates are strikingly beautiful and fit on any desk or shelf. So, whichever product you choose, the veteran in your life is sure to enjoy your thoughtful gift of remembrance. Granite Education Foundation (GEF) and Coller Industries Incorporated are working together, again! Due to our donations and continual support, Granite Education Foundation invited Coller Industries to attend this year’s Excel Evening of Honors. 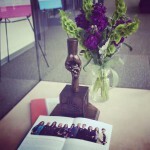 The “EXCEL Evening of Honors” was held on April 21st. Every year, Granite Education Foundation supporters gather to recognize outstanding teachers, administrators and community members whose personal commitment and contribution impacts 67,000 students in the Granite School District. The annual EXCEL Award publicly honors and recognizes educators who raise the bar of their profession. The award recognizes teaching that incites intellectual curiosity in students, engages them thoroughly in the enterprise of learning, and has a lifelong impact. Winners are nominated by school administrators, parents, colleagues and students through an intensive application process. A selection committee then reviews each application. Members of this Excel Selection Committee then surprise each winner at their school with the announcement. This interaction was recorded and shared at the presentation event. The committee received over a thousand nominations and had to select only ten winners. Emily Lehnardt believes that children are perfect candidates for her to “awaken” the human spirit to love life-long learning. She feels children exude great curiosity and seemingly limitless creativity. Emily applies Dr. Einstein’s teaching philosophy in her classroom. She believes Dr. Einstein lived in creative expression and knowledge. His creativity through experiments gave the world cutting-edge information. During the gala, each winner received a special “Excel Award,” a gift basket, a monetary award, and other generous gifts to recognize their achievements. 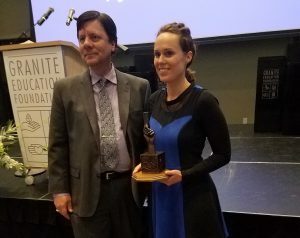 “Every year we have the phenomenal opportunity to recognize educators who exemplify the values and mission of Granite School District,” said Dr. Martin W. Bates, Granite School District Superintendent. 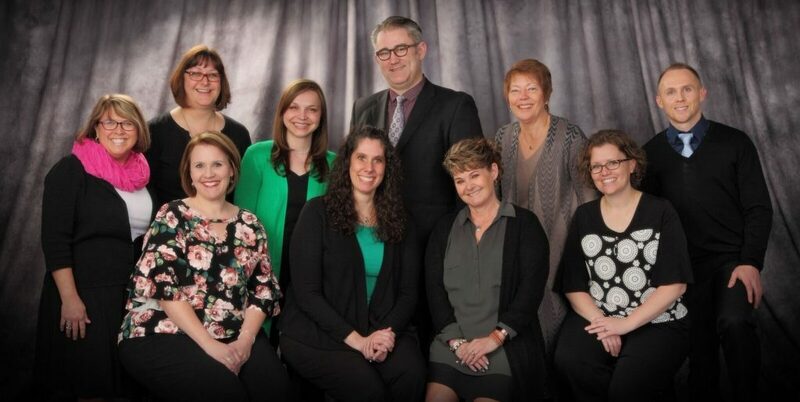 “These individuals have demonstrated exceptional teaching skills and a commitment to student success. In addition, they provide meaningful contributions to their school community, and are constantly seeking ways to improve the educational experience of their students,” said Dr. Bates. 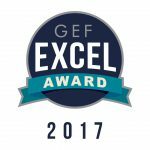 Congratulations to the 2017 GEF Excel Winners! Research shows that students with high-performing teachers can progress three times as fast as students with low-performing teachers. Effective educators can influence the climate of the entire school. Their commitment, passion, expertise, and creativity are infectious. Students love them because they make learning fun and engaging. Administrators love them because they get results. Parents love them because they affirm their student’s potential. In the face of increasing class sizes and insufficient funding and resources, the majority of Granite District teachers are dipping into their own pockets and their own time to bridge the gap for their students. Educators are finding progressive and engaging solutions to institutional problems and changing the world, one child at a time. Coller Industries is proud to be a part of this process. While our role is small in comparison to these educators, we are still happy that we get to take part. Our children’s education has a direct impact on our business as we like to focus on working in our community. 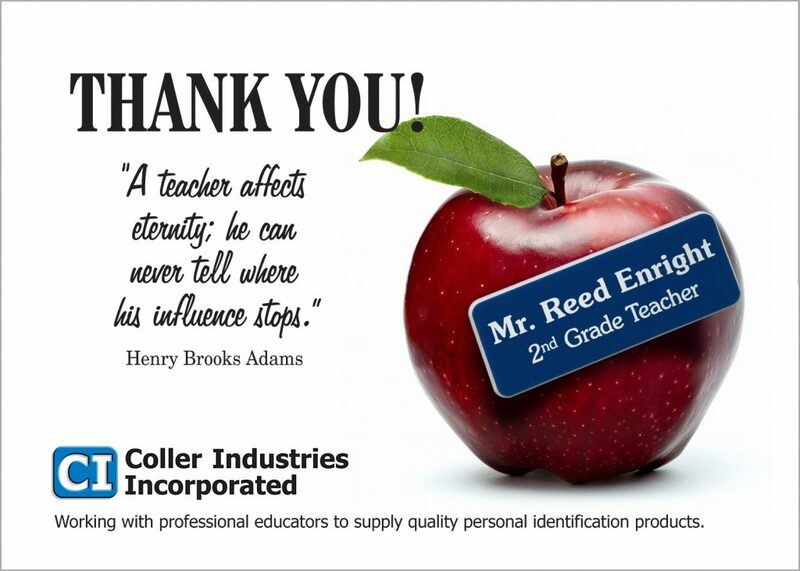 Helping out our local community is a large part of what defines the generosity of Coller Industries Incorporated.